In another irresistible combination of danger, mystery, and romance, Stephenie Meyer tells the devastating story of Bree and the newborn army as they prepare to close in on Bella Swan and the Cullens, following their encounter to its unforgettable conclusion. Bree Tanner can barely remember life before she had uncannily powerful senses, superhuman reflexes and unstoppable physical strength. Life before she had a relentless thirst for blood… life before she became a vampire. All Bree knows is that living with her fellow newborns has few certainties and even fewer rules: watch your back, don’t draw attention to yourself and, above all, make it home by sunrise or die. What she doesn’t know: her time as an immortal is quickly running out. Then Bree finds an unexpected friend in Diego, a newborn just as curious as Bree about their mysterious creator, whom they know only as “her”. As they come to realize that the newborns are pawns in a game larger than anything they could have imagined, Bree and Diego must choose sides and decide whom to trus. But when everything you know about vampires is based on a lie, how do you find the truth? It was a success story that began with a dream – literally. In 2003, a housewife and law school aspirant who had never written a short story in her entire life woke up from a vivid dream about a vampire who was in love with a human girl, but who also thirsted for her blood. The woman felt compelled to write the dream down, just for herself, until her sister urged her to send the manuscript for publication. Fifteen letters and nine rejections later, Stephenie Meyer found a deal that catapulted her to literary fame (and sometimes infamy) with her Twilight saga. In case you’ve been living under a rock for the past few years: Twilight is the story of an ordinary human girl named Bella Swan and her romance with a 107-year-old vampire Edward Cullen. The saga is composed of four books – Twilight, New Moon, Eclipse and Breaking Dawn – that chronicle their romance and attendant complications (werewolf Jacob Black, and the Volturi, who enforce vampire law). Midnight Sun, the companion novel to the saga that tells the story from Edward’s point of view, was delayed indefinitely after the chapters were leaked online, and Meyer allegedly decided to focus her energy on non-Twilight books. Or so we thought. 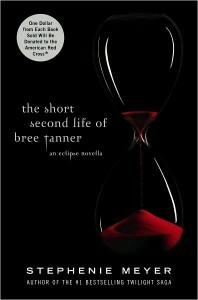 Yet now we have Bree Tanner, a new novella in the same universe as the Twilight Saga. Click here to read the rest of the review.